Click-and-hold on the title bar of the window you want to keep open. Still holding the window by its title bar, move your mouse (or other pointing device) back and forth rapidly a few times to "shake" the open window. All other open windows will minimize to the superbar. To restore them, "shake" the open window again. Also, check out my companion article Windows 7 Desktop Customization to learn more about using and tweaking the Windows 7 desktop. You did what? And then what happened?? Have you ever heard someone say something like this: "I clicked the little square and then that thing popped up. So I moved it out of the way and now I can't print anything. And everything looks funny on the emails... can you help?" If you're the official tech support guy for your friends and family, you'll love a new diagnostic tool that's built into Windows 7. The Problem Steps Recorder (PSR) will allow your friend with computer troubles to reproduce the exact steps that cause a problem. The PSR can be started by opening the Control Panel and then clicking on "Record steps to reproduce a problem". The recorder will capture keystrokes, mouse actions and screenshots until the user tells it to stop. It then saves the whole scenario as a slide show in a ZIP file which your friend can email to you. Another technique which I like even better is using remote desktop access. The ability to see your friend's screen and take control of their mouse and keyboard lets you easily diagnose and fix computer problems without having to be there. These Free Remote Access Tools are not specific to Windows 7, but still very handy when trying to help someone who is not in the same room. Right-click the superbar and select Toolbars, then New Toolbar. Click on Select Folder, and a link to the Quick Launch folder will now appear on the superbar. But it needs a bit of tweaking to work like the old Quick Launch bar. Right-click on the superbar and uncheck "Lock the Taskbar" if necessary. Now right-click on Quick Launch and uncheck "Show Text" and "Show Title". Now Quick Launch will behave like it did in earlier versions of Windows. You can drag application icons or shortcuts to Quick Launch and they'll appear there, ready to launch. You can delete icons without deleting the applications to which they are linked. Windows 7 will spend the next minute or so monitoring your laptop's power consumption patterns and writing a report that you can view in a Web browser. Follow the report's recommendations to improve battery life. In the Start menu search box, type GPEDIT.MSC and press Enter. Double-click "Add Search Internet link to Start Menu," click Enabled when prompted, then click OK and close the Group Policy Editor. Henceforth, when you enter words in the Start menu search box and click Enter, a link labeled "Search the Internet" will appear. Click on it to launch your default browser and search for the words using your browser's default search engine. 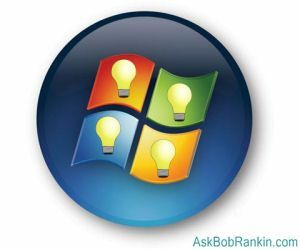 Most recent comments on "Five Things You Didn't Know Windows 7 Could Do"
One of the features that seems to be missing from Win 7 is the Classic View in control panel. I found two possible tips that might make it easier to navigate the various control panel options. First, change the default category view to either large icons or small icons. This will bring up a more detailed menu of control panel items. The second tip is to open control panel and type the letter "a" (without quotes) in the search box at the upper right corner. This gives a very detailed menu of most, if not all, control panel items. This article was very informative, particularly the section on power efficiency. However once the report is created how do you use it to improve your system? Wish it had virtual desktops. But, I guess that would confuse most people. "Windows 7 will spend the next minute or so monitoring your laptop's power consumption patterns and writing a report that you can view in a Web browser. FOLLOW THE REPORT'S RECOMMENDATIONS TO IMPROVE BATTERY LIFE." hello bob..i had a problem my update link and my ie link to the web ..but i can use mozzila..how to fix ie and how to manage or repair link for update my window 7..? Sync should not require a DOUBLE click to show the progress box; single is better. instructions I saw indicated contacts could be MOVED but they are NOT moved; they are COPIED. told me that "Windows Live Mail has stopped working and needs to be shut down." the contacts who I use daily as opposed to those I seldom use. There is no "SEND ALL" nor "Receive all" emails now; this is bad. "Sync" should read "Send & Receive." If I drag a contact from a new folder back to the original "All contacts" folder, it will not go. Windows 7 (plus XP and Vista) work fine with the Sysinternals Desktops utility (and other utilities such as Autoruns and Process Explorer). These utilities are free and very useful. How about doing an article on this for all your readers. And my other comment about buying Windows 7 for $35. Keep up the great informative work. about a year ago. Are you still getting Windows updates with no problems, and is the software still working flawlessly?